In 1849, a vineyard was planted in Angaston, South Australia, which now makes Yalumba the oldest Australian family winery. Yalumba is also part of an elite group of families in Australia, called ‘First Families of Wine’, with the 12 families owning a total of 5000 ha of vines along with 1200 years combined experience in viticulture and winemaking. That’s impressive. 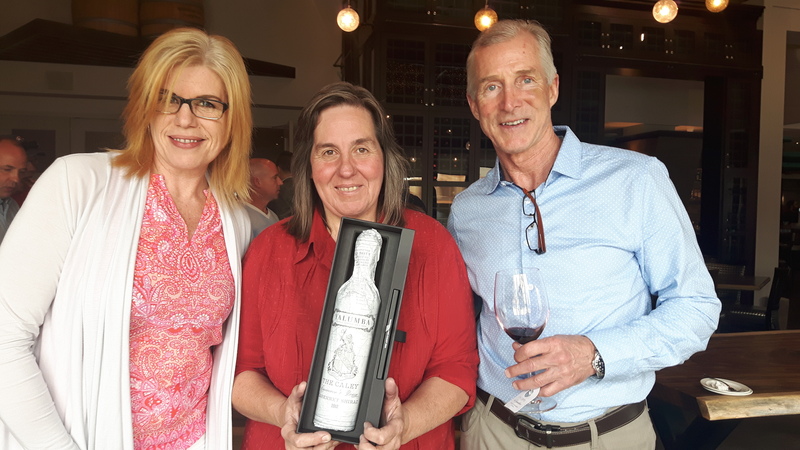 And just two weeks ago, Ambassador Jane Ferrari came to town to launch “The Caley”, a project to bring an Aussie Claret to the world. Grandson to Samuel Smith, the founder of Yalumba, Fred Caley- Smith was a horticulturalist, correspondent and adventurer, who after 18 months of intense travel to locales such as India, USA, Europe and the Middle East, documented his horticultural findings in letters sent back home. The end result was more sustainable viticulture and how vineyards were managed. Of course, I can’t tell the story nearly as eloquently as Jane Ferrari can, but the history is fascinating, which in my books, makes the wine even more delicious, even before it’s even tasted! exception. No overextraction and jammy flavours were wanted, so gentle pigeage was undertaken to achieve just the right balance of colour and tannin. Yalumba is also one of few wineries around the world that has their own cooperage, the building of wine barrels for the purposes of fermentation, maturation and ageing of wine. Having your own cooperage means specific sizes, wood grains and toast seasoning levels, whenever you need them, for the perfect completion of wine! For the 2012 vintage, the wine was matured for 22 months in a combination of both new and old barrels made of French oak; using barriques (228L) and hogsheads (300L). After bottling, the wine rested further for 36 months, and was just released 2 weeks ago, with only 5200 bottles made, 60 of those for all of Alberta! That’s how prestigious this wine is, rivaling Henschke’s Hill of Grace and Penfolds Grange for exclusivity. What a pleasure to be able to taste this wine, and be invited to the inaugural launch of ‘The Caley’, with Jane choosing Edmonton as her starting point. Awesome! On the nose, the wine had strong notes of black currant, eucalyptus, chocolate, violets, and hints of fruitcake. The palate had smooth silky tannins with balanced acid and alcohol, with bursts of black fruits of blackberry and blackcurrant, along with black tea, cigar box and eucalyptus. All with a long, lingering finish. Stunning really, and perfectly described by Jane Ferrari as the ‘George Clooney’ wine – smooth and suave, while the upcoming 2013 vintage (can’t wait for that! ), is more like ‘Wolverine’, muscular and powerful! 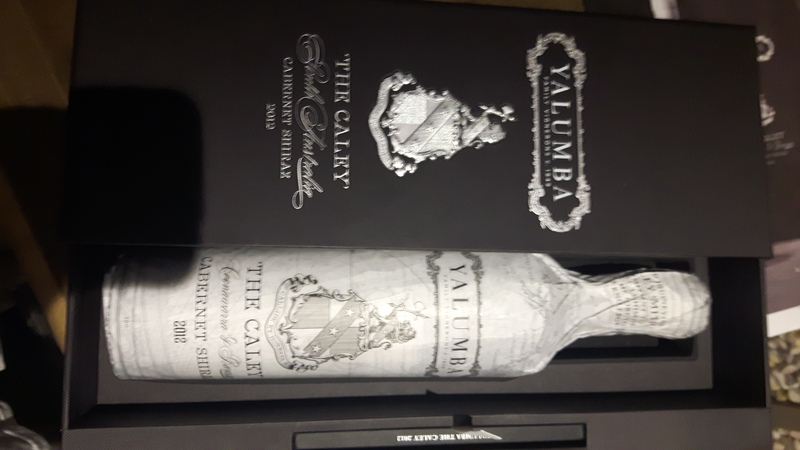 The wine comes wrapped in tissue with a map of Fred Caley’s 18 month journey, and features a book with the history of Yalumba and the wine, all packaged in a beautiful keepsake box. We’ll get four of these stunners sometime in the fall, and if you want to get your hands on one, it’ll be a SR of around $500. This entry was posted in Education, Tasting, wine and tagged Adelaide, Alberta, Ambassador, Angaston, Australia, barrels, bottles, Cabernet Sauvignon, Caley, claret, cooperage, Family, launch, maturation, oldest, Shiraz, Smith, winemaking, Yalumba, yeast. Bookmark the permalink. It’s one of my longest lasting sweet spots – Coonawarra Cab Savs. Haven’t even heard of ‘The Caley’ but I do want one. I really do. 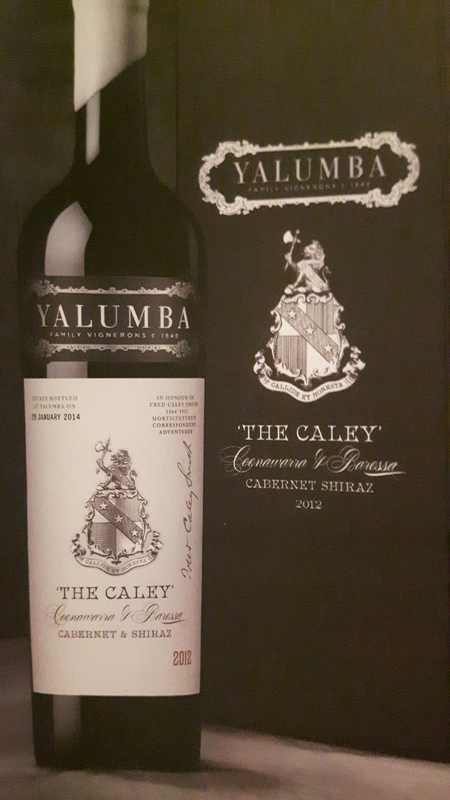 I always get a few of ‘The Cigar’ from Yalumba each vintage – a great expression of what I feel is the most underrated terroir for Cab Sav. – Coonawarra. Thanks for giving me a heads up. Although I might not be able to pull the trigger at the price. I agree. If drinking Aussie cabsi usually reach for the Coonawarra first! I also carry the Cigar in the store. Remember that this is a Canadian price so night be cheaper in whatever market you’re in! I’m in Ontario so no cheaper probably.